The Minicom Digital Signage by Kramer VDS-RD is a dual port remote video receiver unit which is a part of the Minicom DS Video Display System. The VDS is the quickest, most efficient way to move multimedia content from player to multiple displays. A one-to-many, point-to-multi-point system for transmission of high quality video (VDS) or audio and video (AVDS), the system distributes rich multimedia content in real-time from any type of player to multiple display devices. This VDS Remote Dual Screen remote receiver provides simultaneous support for two display units at the same location. 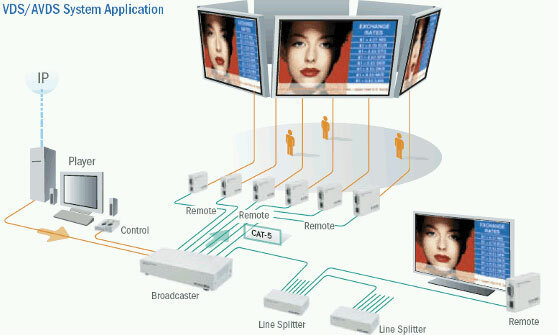 The VDS Remote Dual Screen lets you double the monitors in the system and saves on CAT5 cable and installation costs. Like the VDS Remote, it can be connected to either a VDS Broadcaster or VDS Line Splitter and receives its power from the CAT5 cable.